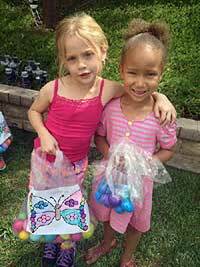 With Easter approaching, we had a ton of fun at our annual egg decorating day here at Mary’s Valencia Schoolhouse. This year was quite a bit different and instead of creating our decorative eggs the way we always do, we had a dear friend join us to teach us all a new way to decorate our eggs. 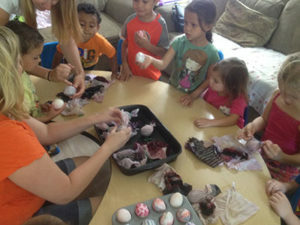 M’Lissa Kurtz volunteered a part of her day and stopped in to teach us a new and fun method of egg decorating. Also, we found Martha Stewart has provided information about this egg decorating project, so you may visit her link here to learn more. M’Lissa loves children and the children immediately connected with her, listening closely and participating in the egg decorating. Here’s what we did: M’Lissa brought over some old silk neckties(ties must be silk), cut them into pieces, wrapped the tie pieces to cover the raw eggs, then boiled until done. 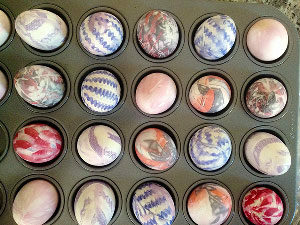 Then, once the eggs cooled, we unwrapped the eggs, revealing bright, colorful and detailed decoration! This was lots of fun and another great way to teach the kids something about colors, and how an impression from a pattern transfers to an egg. When doing our preschool projects, we make sure the children actually get to participate and learn something while having fun! For this project, the children participated by helping to actually wrap the raw eggs with the ties and then they helped un-wrap the eggs after they cooked, and cooled. Amazing enough, with all the egg handling going on, only one raw egg was accidentally cracked. It’s interesting to note, since it was just a small crack, we boiled it anyway and it still worked. Thank you to M’lissa Kurtz for helping us with this project and being a part of our Gregory Family Child Care. 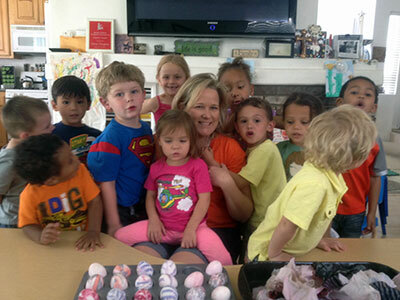 If you’re looking for home childcare in the Valencia or Santa Clarita area, contact Mary Gregory at 661-210-7617. We hope you enjoyed the share, Egg Decorating Fun With M’Lissa at Mary’s Schoolhouse. Please post a comment and share your egg decorating ideas with us!